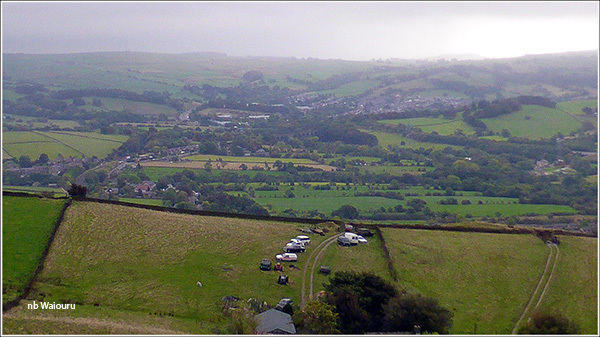 Finding a local high feature and getting some panoramic views of the Peak District seemed a good idea. 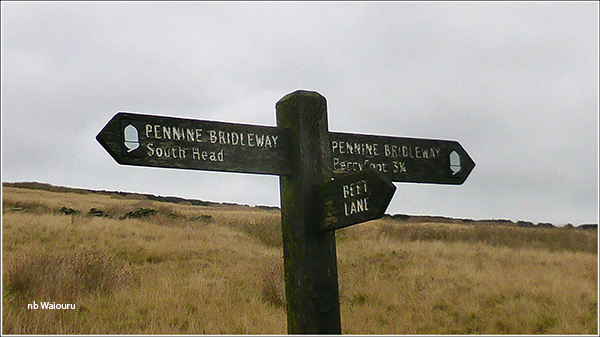 After carefully examining the map a walk to the northeast of Bugsworth Basin looked promising. 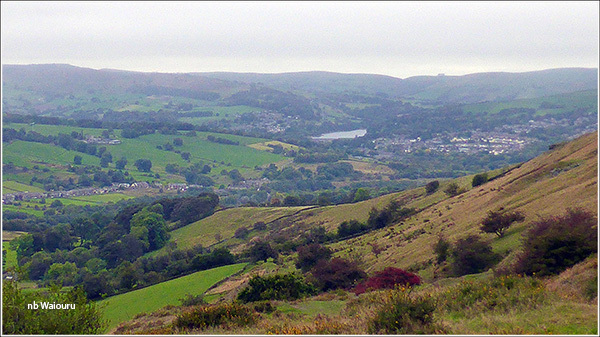 24 kilometres would get me to Kinder Low. At 639 metres it appeared to be the highest hill in the local area. 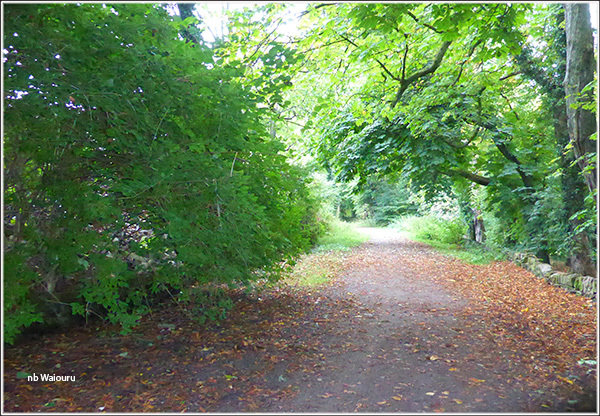 After tracing the local footpaths I had a route that could be transferred to the gps. 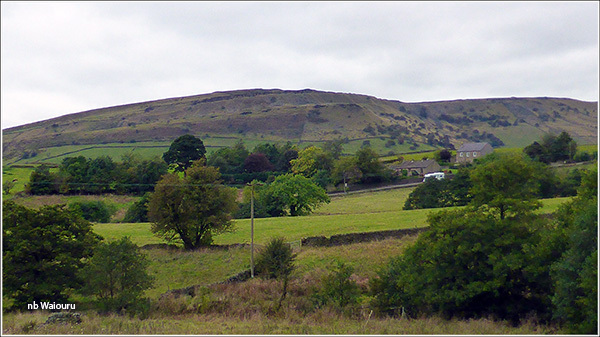 The first hill was Chinley Churn. Wikipedia describes this as a large nondescript hill which has been heavily quarried. I did notice the rock face as I made my way up the zigzag path. Halfway up I met a couple coming from a different direction. They immediately identified me as Australian and mentioned they had a son living in Melbourne. For my part, I noticed they were wearing jacket and fleece whilst I was in a Tshirt. 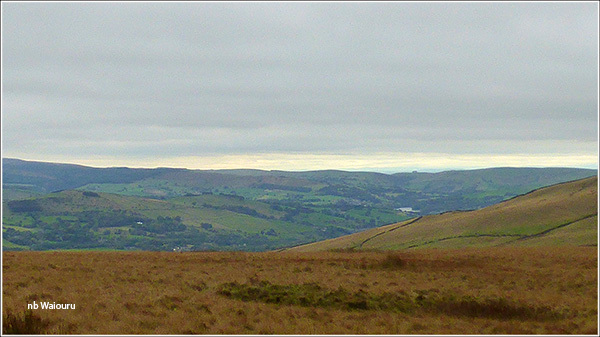 Two thirds the way up Chinley Churn I looked back to see Chapel-En-le-Firth in the valley below. 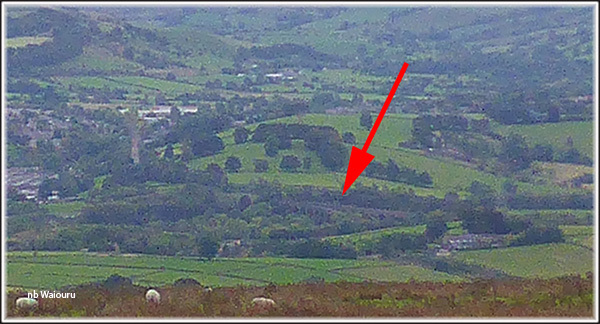 There is a multi-arched railway bridge in the middle-left of the above photo. At the time I didn’t realize my walk would enable me to take a photo of the other side of the bridge. 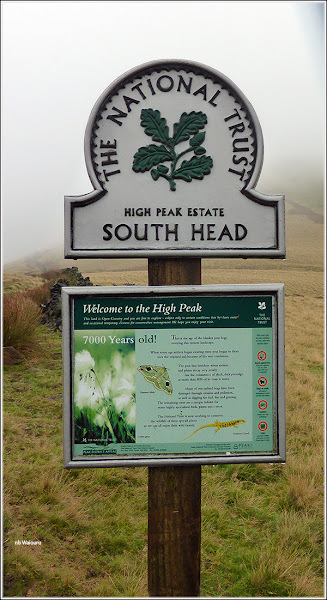 The route from here took me along the ridgeline until Bugsworth disappeared from sight. Shortly after reaching this feature the weather started to deteriorate and I realized why those other two walkers were wet and wearing jackets. The ground started to get very soft and as I’d already read the National Trust sign I knew this area was a 7000 year old peat bog. 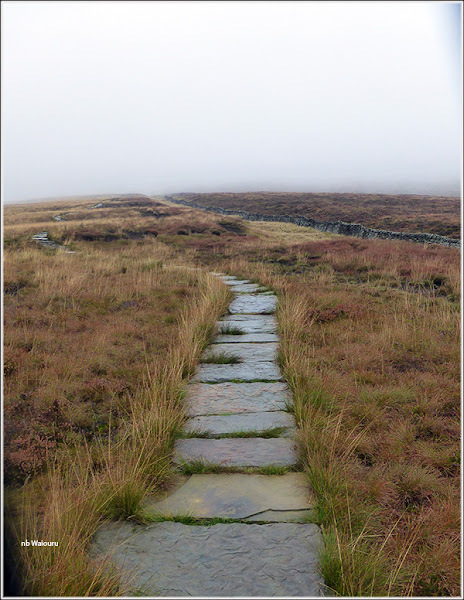 However some people had kindly laid stone slabs to create a designated path. I hadn’t planned a return route and after looking a the gps decided to head back to South Head. 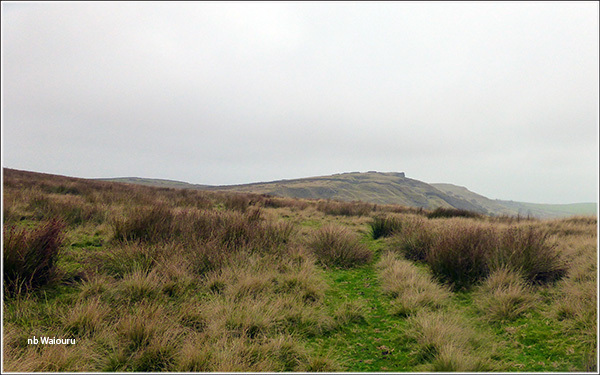 I was just clearing the cloud/mist line when a party of six walkers appeared from my left heading towards Kinder Low. And here was me thinking I was the only crazy person on the hill! Once out of the mist I had good views to the north. The thing I immediately noticed was the sky on the horizon to the north. The @#$%^ weather was clearing! If I had arrived at Kinder Low an hour later I might have seen something. On reaching South Head I took a photo of the signpost and decided to go south towards Chapel-En-le-Firth. It’s boring walking back the route you came. Walking down Beet Lane (which started as a rubble strewn groove) I was able to get a view of that same railway bridge from the opposite direction. From this position it was possible to see there were actually two bridges. 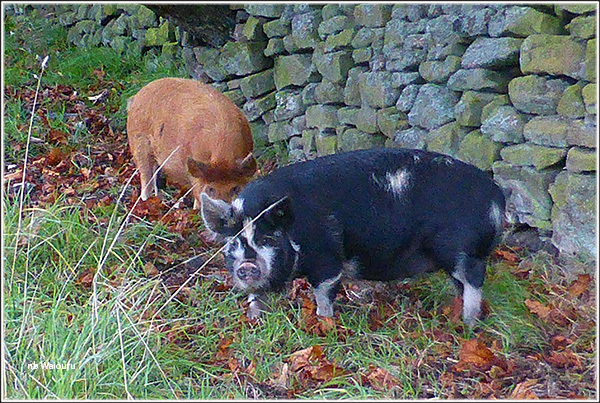 Went past Ben and Kelly who were doing their usual grubbing around. On reaching the village of Chiney I checked the map and realized a short detour would enable me to follow the Peak Forest Tramway Trail back to Bugsworth Basin. Well it was actually my feet that made this decision. Presumably because they knew it was likely to be easy going. 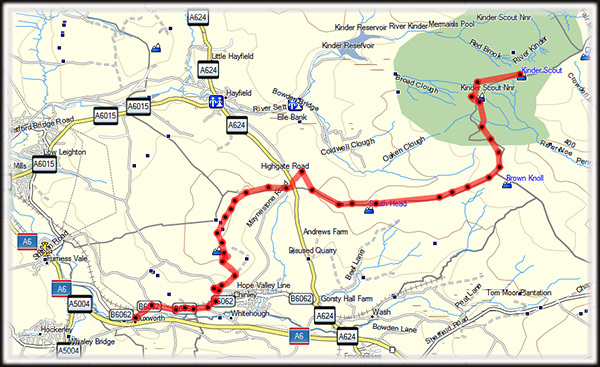 This is the route of an early, horse drawn, rail system linking the local quarries to the Peak Forest Canal at Bugsworth Basin. 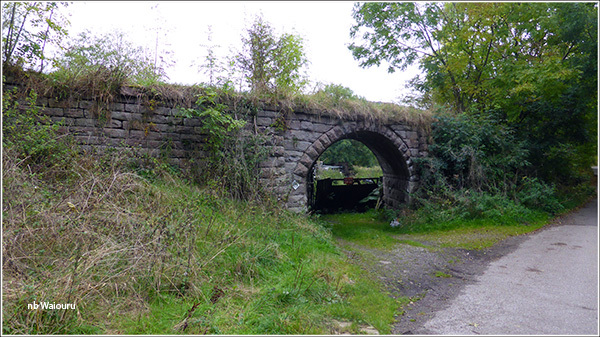 The product was local limestone that was transported by canal to Manchester. The trail doesn’t follow the exact original route. I took this photo to the side of the trail. On arriving back at Waiouru five hours after departing (slow walker) I found nb Alton filling and emptying the tanks of the boat opposite (diesel & toilet). 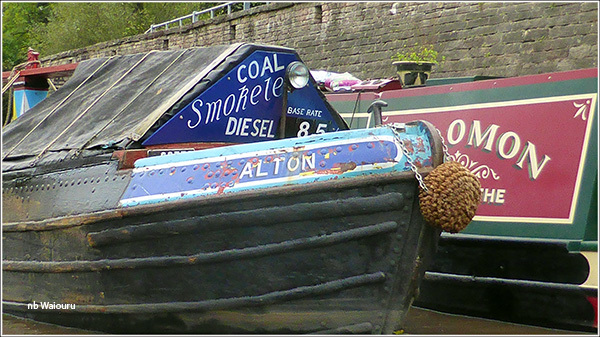 However as we had bounced on the bottom a few times coming up from Marple to Bugsworth Basin I thought topping up the tanks now might add to any potential problems on the return journey. 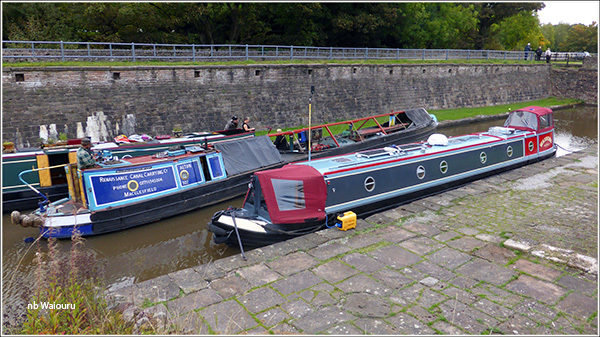 Interestingly, the boater opposite told Jan they have a paid permanent mooring in the basin. I hadn’t realized this was an option.